Wednesday, July 18 was Mandela Day, which also happened to be the 100th birthday of Nelson Mandela. In celebration, the Simanye team chose to donate care packs to the Immaculata Shelter at 17 Sturdee Ave. in Rosebank (a short walk from our offices at Impact Hub Joburg). Immaculata Shelter has approximately 400 people on their register to whom they provide daily meals and hot showers; 100 of which are permanent residents for a period no longer than a year. They also provide job seeking assistance, counseling, and referrals to some of the neediest residents in our community. 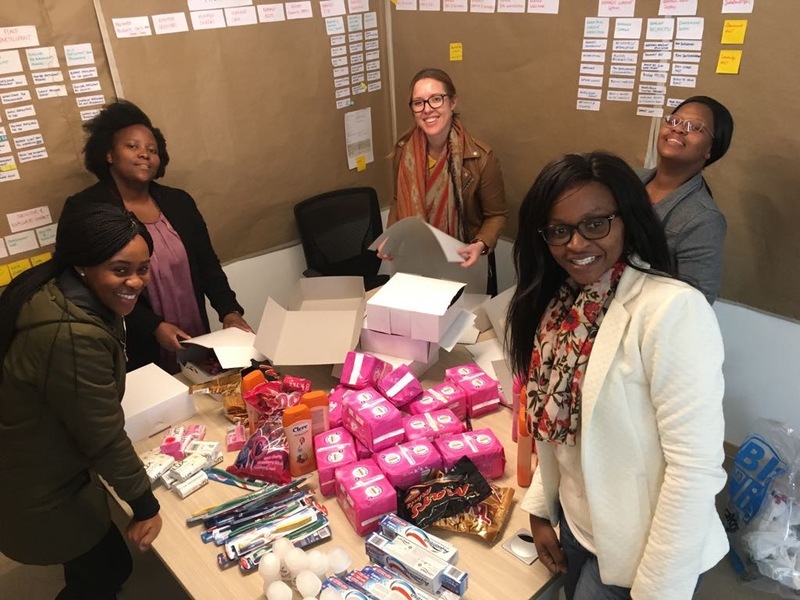 They have been serving the community since 2003, and the Simanye staff were excited to offer a little help for Mandela Day by putting together care packages for the 20 women who currently reside at the shelter. The shelter currently houses 20 women semi-permanently, and they were the focus, each receiving a personal care pack compiled by members of our team. The office got excited when it was time to put the care packs together. Very quickly, a system was in place and everyone got into the rhythm of the work. Included were mainly personal hygiene items, which were on Immaculata’s list of most-needed items, but those involved couldn’t resist adding in some extra treats for the ladies. A few of Simanye’s team members also went to Immaculata to meet and hand over the care packs to the women, who were most appreciative. Paying it forward and giving back in the name of Madiba is always a yearly custom for many around South Africa, but Immaculata Shelter operates 365 days a year, so if you are interested in helping support them, donating some of your used or non-perishable food items is a good place to start. If you have any of these items, or questions about how you can help, call 011 447 9801 or email Immaculata’s manager Michael Ntuli ([email protected]). The residents and those that rely on Immaculata will appreciate your generosity!